She is gone; Phoenix, my special, darling girl. Boo is ready for The Jamboree! 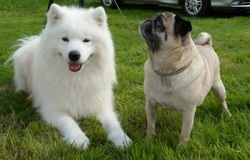 Boo and his friend Stan, at Lunesdale Agricultural Show. A glorious day, the sun was shining. I again sported the agricultural show ensemble, camouflage shorts and walking boots. Elegant? No! A slight hiccup; we missed Boo's class. I don't imagine for a moment he minded. Boo met one of his favourite girls, Ola, the Spanish Water Dog. Boo came over all "Austin Powers" but Ola wasn't having any of it. He's nothing, if not persistent. I have brushed yesterday's mud out of Boogie but he still bears the aroma, of slightly stagnant pond. 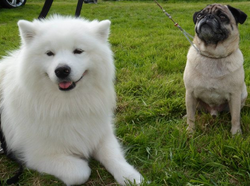 A Grand Day Out at Cartmel Agricultural Show! We squeezed into the Micra. Boo in the boot, Shawn on the back seat with the backpacks and waterproofs, humans up front. The boys politely ignore each other so there's no issue, with the snug excursion conditions. The food marquee is my favourite place, local pies, Cumberland sausages and hand made chocolates. What more could a girl ask for? We came home the scenic route. Of course, a euphamism for being lost. Boo is watching the Olympic Dressage; lying a metre from the telly. Fascinated. He's all groomed out, for Leeds Champ Show tomorrow but there's a limit to what you can achieve, when a boy is out of coat. Boo studied me, weeding the front garden. Phoenix ignored me; she is so above such mundanity. Boo eventually managed a tripe chunk for his breakfast but it was a long drawn out proceeding, excruciating to watch. Ah! You see, I used my noggin; chopped Boo's tripe into bite size pieces. He ate the lot.......well, eventually. I suspect I spoil this boy but what is a mum to do? Phoenix enjoyed the tripe chunks I bought today. Boo; oh dear: altogether too much of a mouthfull. He handed his tea over to a grateful "Miss Piggy". Gone, before I could stop her. Who'd have thought it! 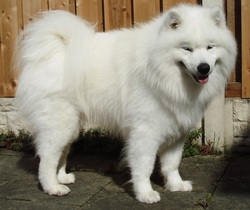 Boo, off lead at Jiggility and being the best of boys, for me. A little over enthusiastic on the A Frame but Hey Ho! That's Sami boys for you. Thanks for trusting him, Gail. You were right! Despite the rum, I was on the beach with Boo by 5:30am. I surprised myself! A summer evening! We sat out, devoured Jack's Special Ribs and imbibed black spiced rum. Boo sat with us, Phoenix as always, posed in profile, at some distance. Checked out my wellies. We have several outdoor shows coming up, so I thought I'd better be prepared. After an internal inspection, I am pleased to report, there were some spiders and a considerable amount of dog hair (fancy!) but generally, an intact wellington. I have had some hair raising-ish experiences parking in sodden fields in my little Micra. Don't get me wrong, I love my Micra but it's definately an urban car. I suppose like me; essentially an urban person. Much better start to today. No poo! We had a grand time at "Jiggillity", last night. Boo tackled the Big Boys' Dog Walk; what a brave boy! There weren't many people there, so Boo and his mate, Shawn had the opportunity for multiple runs. They were pooped; we were pooped. Success. Do you ever wake up in the morning and wonder exactly what that smell is? It happened this morning, it sometimes does. Not often but sometimes. Phoenix had done a Big Poo, in the kitchen. I think yesterdays lamb bone had an unfortunate and unintended impact. At least she made it through to the kitchen. Boo has no such finer feelings, if caught short. Note to self. Don't you remember what happened, last time you gave Phoenix a lamb bone? Poor Boo had his eyes shut for much of our walk. Far too wet and windy for my brave Tundra Beast. We practised our recalls on the beach; funny how well it can all go when there are no distractions (i.e. anything else around)! Our 3rd "Jigility" tonight. I think we're both enjoying it. Well, I am anyway and Boo does a lot of shouting.